Stella Pointeau (right) fences with an opponent. The junior foil has only lost one match in her entire career. 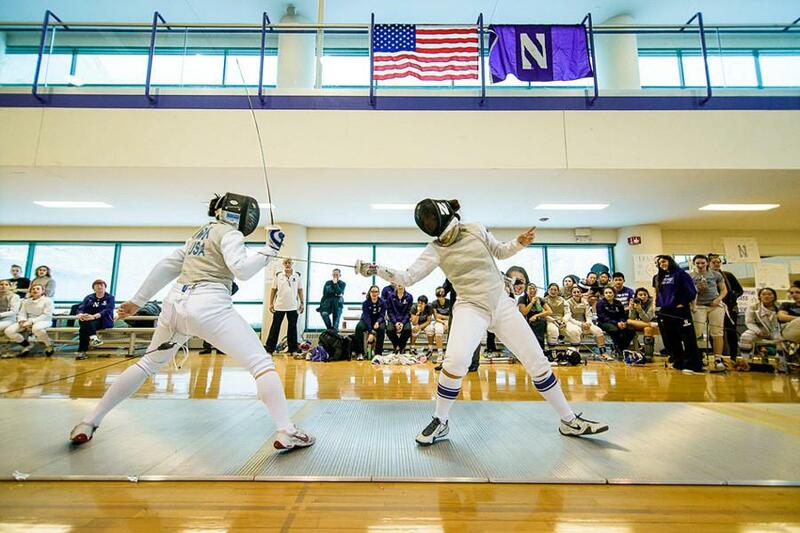 After a weekend of rest following the Northwestern Duals, seven of Northwestern’s sabre fencers are headed to Cleveland for the USA Junior Olympic Championships. The Wildcats will be taking on nationally ranked fencers in individual competition this weekend, in contrast with their NCAA-style team matches and tournaments. This competition includes a pools round followed by seeded matches. Sophomore Lucia Procopio said she feels most comfortable with this format, as the event mirrors tournaments she’s competed in for the last nine years. However, she said her focus has shifted since her high school days. Although the competition may not be as steep because of the under-19 age limit, the 15-point direct elimination round, as opposed to the 5-point dual meet bouts, will force the women to maintain mental and physical stamina over a longer period, sophomore Stefani Kahookele said. Procopio said she and others on the team are recovering from injuries, so the extra weekend of rest after the NU Duals helped prepare them for the longer rounds of competition. She added the seven fencers competing can use the meet to experiment ahead of their return to NCAA competition. Because this is a USA Fencing tournament and not an NCAA-sponsored tournament, the team’s performance this weekend will not affect its national ranking. After upsetting then-No. 3 Princeton at the NU Duals, the team showed it was well-prepared to fence top opponents. Schiller said he is confident in the abilities of the fencers attending the Junior Olympics because of their success at the home duals.